A scene from Jiro Dreams of Sushi. Eugene’s Bijou Art Cinemas just hosted the Cinema Pacific Film Festival, which is devoted to films from Asia and from the Pacific Northwest. This annual festival is just one of the many benefits of living in Eugene. (If I seem to be on a civic boosterism kick, it’s because of a recent ESPN article that portrays Eugene as a warren of zonked-out hippies with questionable grooming habits.) I regret that because of previous commitments I was not able to attend all of the films. Based on the ones I did see, however, I was impressed by the selection job that the festival organizers did. I found every film I saw interesting in some way. Two that particularly stood out for me were documentaries about two artists in Japan. 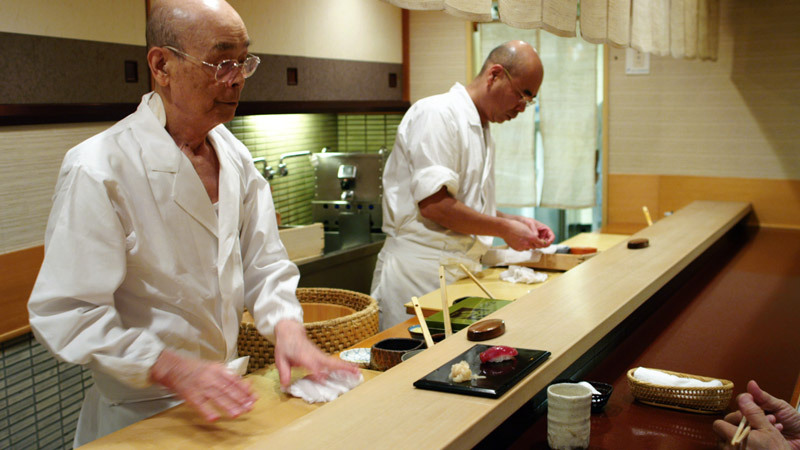 Jiro Ono is Japan’s most famous sushi chef. He runs a sushi bar in a Tokyo subway station. The Michelin guides have given the place a three star rating. People make reservations months ahead of time just to eat there. 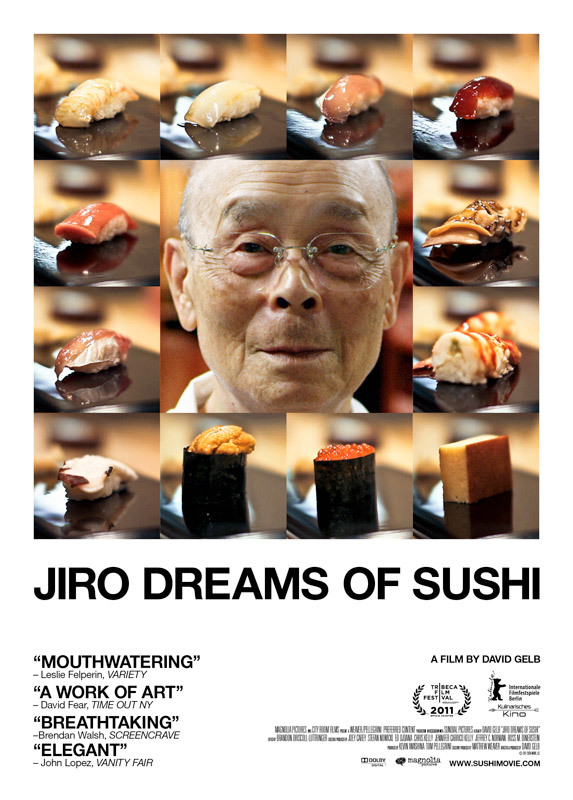 David Gelb’s film, Jiro Dreams of Sushi examines the life and work of this cook who, at the age of 85, says he will never retire. He dislikes taking days off. He is assisted by his son, Yoshikazu, and by a small, hard-working staff that he trained himself. An apprentice at Jiro’s restaurant has to train for ten years before he is considered a shokunin (chef). Yoshikazu is destined to take over the restaurant after his father’s death. However, a sushi chef tells us that because of his father’s reputation, Yoshikazu would have to be twice as good just to be considered his equal. Jiro tells us that he arranges his meals like music. He starts with light, subtle flavors and gradually works his way to heavier ones. Gelb builds upon this idea with a shrewdly constructed musical soundtrack. As we watch Jiro and his assistants, they at times almost seem to be moving in sync with the music. On a somber note, both Jiro and Yoshikazu report that they have seen both the quality and quantity of fish sold in markets decline over the years. Yoshikazu blames this on over-fishing. He is particularly critical of the way tuna are caught, saying that many of these fish are captured before they are mature. I thoroughly enjoyed this film. It made me hungry for sushi. I watched Astro Boy on TV when I was growing up. This show would likely strike contemporary children as crude (it was in black & white, for one thing), but to me it was magical. I remember I was puzzled at how his feet would suddenly disappear and flames would shoot out of his legs when he would fly through the air. So my curiosity was piqued when I heard that the festival was showing a film titled The Echo of Astro Boy’s Footsteps. This movie is about Matsuo Ohno, who did the sound effects for Astro Boy. Actually, he was the sound designer. He would actually get mad at people if they said that he did sound effects. Instead of trying to imitate noises, he would create whole new sounds. 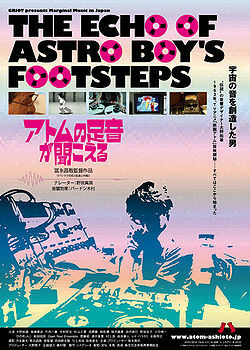 The title refers to the curious sound for Astro Boy’s footsteps, which he created by manipulating recording tape. Ohno became interested in electronic music in the 1950’s, when he heard a Stockhausen recording. He continues to compose and perform to this day, trying to create what he calls “ethereal music”. A traditionalist, he continues to use reel-to-reel tape players and oscillators, instead of computer programs. Ohno has a reputation for being irascible and difficult. Yet he devotes a large part of his time to teaching music to mentally disabled persons. He says that we can all learn from such people. However, this film will not dispel the stereotype of artists as eccentric people. A friend of Ohno’s tells us that when the latter was young, he preferred to enter buildings by climbing through windows.